Alaska’s bounty of quality fisheries is something we can all be thankful for. Here’s a theoretical for you. 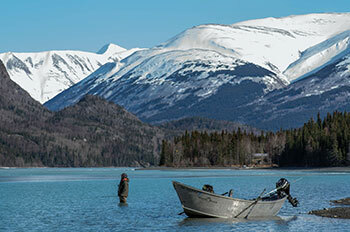 If you had to choose one top species to fish for, and one top fishing location in Alaska, could you do it? Could you choose just one top fish and one top fishing location? Some of you could answer this with ease. Halibut fishing in Prince William Sound, for example. Or, sockeye fishing on the Kenai. For many others – especially those who’ve fishing in multiple locations around Alaska – the answer might not come as easy. And that’s something we can all celebrate. Anglers come from the world over to fish in Alaska. This state is on many anglers’ bucket list locations. And for good reason. An abundance of fish? Check. Exceptional beauty? Check. It’s getting late in the year. In much of the state, anglers are dusting off their ice fishing gear and preparing to hit the hard-water. The fish are waiting. Let’s start with the facts. Steelhead (Oncorhynchus mykiss) are anadromous rainbow trout. Like salmon, they hatch and rear in freshwater, then go to the ocean to grow and mature before returning to their natal streams to spawn. Steelhead have complex life histories: they spend varying amounts of time in freshwater and saltwater, they return to their natal streams in the fall or spring, and they can survive to spawn multiple times. 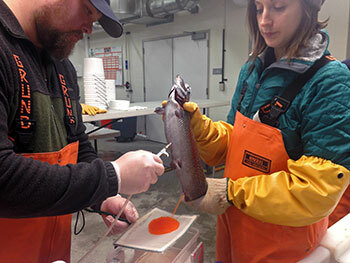 Hatchery-raised Rainbow Trout: Using Mother Nature’s Tricks to Provide Fishing Opportunities. If you’re like most anglers who are searching for a new spot to fish, you want to know before you go. You want to know about species present, tackle suggestions, access, amenities, parking, boat launches, run-timing, etc. The new gofishak application is specifically designed to provide anglers with all the information they need for each specific fishing spot. This application provides information on both salt and freshwater fisheries, stocked waters and boat launches or harbors. In addition, quality images of each location are included. Currently, 170 locations in Southeast Alaska are available on the gofishak application. Each of our management areas in Southeast Alaska have an online map with some of the most popular sport fishing locations for both saltwater and freshwater sites. The Division of Sport Fish will continue to add locations throughout the state as this application further develops. We encourage you to access the interactive map and see if you can find new fishing locations for you and your friends and family to enjoy. We also encourage you to contact us with your comments on how to improve the application. As always, we are available to answer any questions you may have related to this application or to sport fishing. Be sure to bookmark the site and re-visit the gofishak application frequently. You may find your new secret fishing spot. While snow has hit a majority of Southcentral Alaska and anglers are patiently waiting for the lakes to freeze, Kodiak Island is still experiencing fall weather. 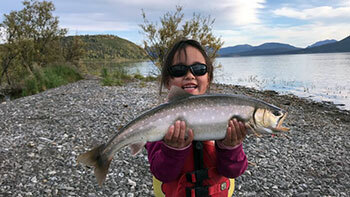 Kodiak offers superb fishing opportunities year-round, whether it is in saltwater or freshwater. November is prime time to fish for rainbow and steelhead trout; however, those are not the only species anglers can target at this time of year. As the season progresses, and frost starts to settle in Kodiak, anglers can still find coho salmon and Dolly Varden swimming throughout Kodiak waters. If anglers are looking to hook a big catch, steelhead trout and coho salmon can be found just three miles south of the city in the Buskin River, and Dolly Varden are commonly found in Buskin Lake. 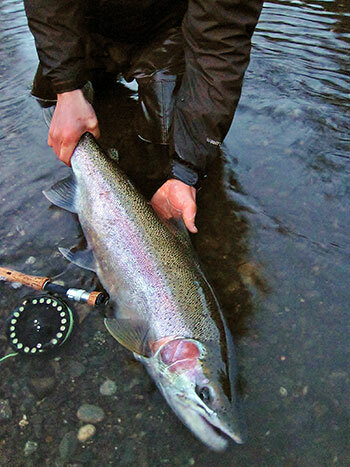 Anglers are reminded that steelhead trout are catch-and-release in the Kodiak Road Zone. Anglers reeling for one final chance to hook a coho salmon can also explore the Pasagshak River and Lake Rose Teed, however, anglers are reminded to review the bag and possession limits for the areas they intend to fish before they go fishing. ADF&G stocked lakes are accessible near to the road system and within city limits. Stocked lakes make fishing accessible to anglers of all ages and abilities. Stocking information and brochures can be acquired on the ADF&G Lake Fishing webpage or at the Kodiak ADF&G office, so please stop by for a visit! Heitman Lake is just one of the many lakes that ADF&G stocks with rainbow trout and is just a short hike to get away from the crowds. Just follow the trail for about 1.25 miles for an opportunity to fish for rainbow trout in a pristine area with mountain views. Anglers can find themselves a fishing adventure, whether they head North or South. So, gear up, dress warm, and test out the waters yourself. Share your fall and winter fishing adventures using #wefishak. Well it looks like winter has finally arrived in the Interior. Rivers and lakes are beginning to ice-up but are not yet safe to traverse. So, no ice fishing for a while, but you can still think about the upcoming season. Most specifically, let’s talk public-use ice fishing huts. 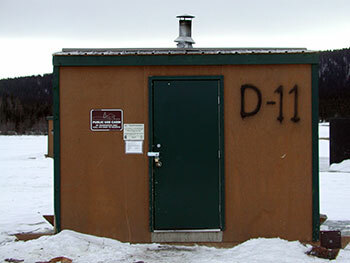 The Department of Natural Resources (DNR) and Fairbanks North Star Borough (FNSB) place, and rent ice fishing huts, when ice thickness warrants it. This varies from year to year, but huts are usually available from December through March. Each hut, constructed by the Alaska Department of Fish and Game using funds from the Federal Aid in Sport Fishing Restoration Program, has four holes for fishing and a wood burning stove to help keep you warm and toasty. The ice fishing huts on Birch and Quartz lakes are managed by DNR. You must provide all equipment and supplies, including firewood and a means to open the holes since they freeze shut between users. The DNR website/permit has a good list of other things to bring to help make your fishing adventure a comfortable, and perhaps successful, experience. For ice fishing huts on Cushman and Chena lakes, you will have to contact the FNSB. A small bundle of firewood is provided for the borough ice houses (additional bundles available for purchase for $5.00) and they bore the holes for you! Just note: ice huts are not yet available for reservation, but we wanted to remind you of the opportunity. You may want to start checking with DNR and FNSB in late November for the possibility to rent these huts. Fall is often the time of year when folks gather to share their bounty with friends and family. For many, it might include watching a variety of different sporting events, with plates full of snacks. Give this recipe for Wild Alaska Rockfish Nachos a try and your next gathering.